I was recently able to try out the XUANRUS Dog Travel Water Bottle, which is absolutely awesome. It's a portable pet water bottle that also holds treats or anything else you need to take with you for your furry friend. Ideal Travel Water Bottle - 12oz capacity fresh water,quickly provide your thirsty pets with fresh water when outdoor walking, hikes, traveling. A perfect travel water bottle for pets. No Waste: No waste -One key open/Lock water,Press button for water to flow in and out of the reservoir, at a sufficient rate to prevent spillages. High quality material: FDA approved, lead-free, BPA-free, PET+ ABS, safe and durable, easy dismantling and cleaning. Need a bottle that's simple, lightweight and requires no extra bowl? Want to easily hydrate your lovable dog on the go? 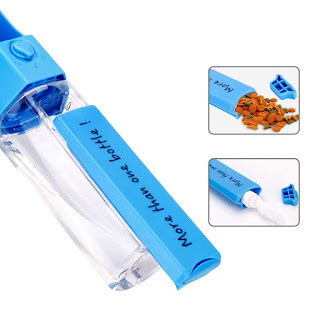 Are you tired of using a messy dog water bowl? Do you walk, run, bike, skate or bring your dog with you to restaurants? Do you need a strong yet flexible bottle that is going to last? If you have these needs, then this is for you! I recently had two waves of nostalgia that came out of nowhere - or so it seems. One was today and one was yesterday. Yesterday I was cleaning out my linen closet and came upon one of the sewing projects I had done as a kid. My mom saved things like that so after her death, I have it too. It was a practice thing it seemed - not a finished project but different designs on a towel type of thing. I took sewing lessons as a kid and we'd make things like totes and pillowcases. I remember going and enjoying it because there were other girls there my age and it was class but fun classes. It brought back a lot of memories. I can't sew that well now but at least I have the basics. For those of you who still do, you can find more great sewing tips and product reviews from our friends at Teach You To Sew. The other thing that happened was today actually. I'm watching Rosemary's Baby and working and was just swept with a sudden burst of major reminiscence. I have no idea why. I was remembering how we'd always go visit relatives on the weekend and in this case, I had an entire memory of going to see one of the aunts or uncles in the hospital about 100 miles from here. Right down to the music and what book I was reading when we crossed the bridge going into Fort Walton. BTW, those were People of the South Wind by Kansas and I was reading The Godsend. The song came out in 1979 and the book in 1980 so I even have the right timeline. How wild is that? Sometimes I wish you could go back in time and relive one day here and there. You can't change the future or anything worth a sci-fi movie but you can just experience certain days like the prom or a first day - stuff like that. I'd even go back and experience the mundane - granted you could do it often.